Le Mariee' : Having A Hard Time Deciding On A Bridal Makeup Look? Having A Hard Time Deciding On A Bridal Makeup Look? Having a hard time deciding on your bridal makeup? Your not alone! This is very common and can happen when it comes to hair styles as well and the combination of the two of of extreme importance. A few tips to help you along the way, are expert advice ofcourse, and reviewing photos of yourself with your hair up or half up or down, wavy or straight.. what flatters you most? face shape plays a huge part as well. Is there a paticular part of your face that you want to focus on? The most common is the 'eyes" and nothing beats a well defined eye with false lashes! If you cannot decide between dramtic makeup/vintage/ sweet/classic or high fashion. Then its best to go with classic, as this is timeless and wont dissapoint you later on in life! Just remember, to get a classic look in photos you will need more makeup than you would normally wear.. more pigment on the cheeks.. the lipshade should be a step or two up to show up. 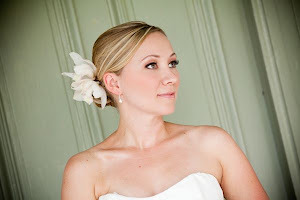 All in all a makeup trial with a pro makeup artist and pro hair stylist is your best bet! Dont risk it!